Free shipping. Buy direct from HP. See customer reviews and comparisons for the StarTech.com 1 ft Short DisplayPort 1.2 Cable with Latches M/M - DisplayPort 4k. Upgrades and savings on select products. 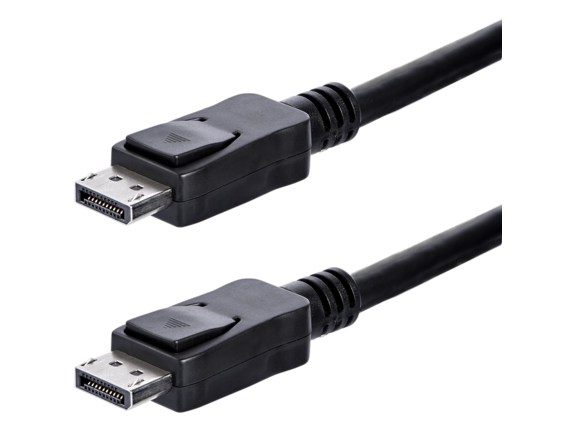 The DISPLPORT1L 1ft DisplayPort 1.2 Cable with latches provides a secure, connection between your DisplayPort-equipped devices and is capable of providing higher performance than either HDMI® or dual link DVI. The DP cable supports high resolutions of up to 4k x 2k (4096 x 2160) @ 60Hz with a maximum HBR2 bandwidth of 21.6 Gbps. The cable also supports Multi-Stream (MST) for daisy chaining multiple monitors and provides optional audio support. The short 1-foot DisplayPort cable is perfect for mobile applications, such as connecting your laptop to a monitor and it provides a portable solution that makes it perfect for carrying as a laptop accessory. The DISPLPORT1L is backed by StarTech.com's Lifetime Warranty, for guaranteed reliability and ensures that digitally protected content is displayed properly, with both HDCP and DPCP capability.